They said that dinosaurs would never roam the Earth again, and after 65 million years of being right, we can finally prove the nay-sayers wrong. Not just that, but they’ve come back to help humanity’s struggle of holding and maintaining the delicate food delivery system known as hard-shell tacos. 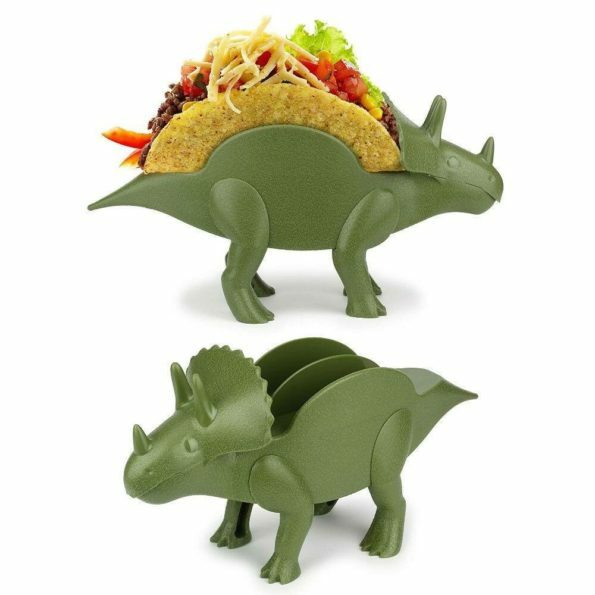 The prehistoric awesomeness of this triceratops-shaped taco holder is a sight to behold. Having a few of these on your dinner table for when the party guests arrive is definitely going to draw a few awe-filled gasps. This is an extremely versatile product which can also be used to hold on to waffles, toast, sandwiches, CDs, and cigars.